We all know that the roads are a hazardous place for children (and grown ups, for that matter) but how much attention do you pay to what's going on in your car? In 2004, 24 children aged 0-11 were killed and 372 seriously injured while travelling in a car. The largest group within this were the 0-4's of whom 15 were killed. Another 2,077 were slightly injured in cars, and yet the number of products on the market for in-car safety is mind boggling, as are the strict standards that car seats must meet. Despite this array of products, a survey conducted by the Transport Research Laboratory in 2004 showed that 5% of 0-4 year olds were not restrained in any way in the rear of cars. As of 2006, it is now illegal for any child under the age of 12, or less than 135cm tall, to travel in a car without a booster seat. Since the new laws came into force, Police have been carrying out spot checks on children in cars and if they are not securely fitted following the legal guidelines, the driver can be given an on the spot fixed penalty fine of £30 with a maximum fine of £500. Where do they carry out these checks? Outside schools. The morning and afternoon school runs are perhaps unsurprisingly the peak times for injury to children in cars. Often parents are parked illegally for a start so the element of rush and 'just get in, will you' creeps in. For more details of the new laws regarding child car seats, please check out the article aboutNew Car Seat Laws for 2006 on our sister site www.safekids.co.uk. You can protect your children by using a properly fitted, purpose made child car seat which meets the current safety standards and is appropriate for your child's weight and height. Try before you buy and get a trained professional to demonstrate how to fit the seat. Most of the large motoring accessory outlets like Halfords have trained fitters. When fitting a child car seat in your car, always follow the manufacturer's instructions thoroughly and allow plenty of time; it isn't always a quick process and you will find yourself climbing all over the car, but it is worth it to have a securely fitted seat. The same applies when it comes to strapping your baby or child into the seat - make sure you check the straps and that the seatbelt locks when you give it a jerk. Remember to make sure your child car seat is properly fitted every time you use it. Seat belts and straps have a habit of loosening when a child has been wriggling around in it for several journeys. Always keep a copy of the fitting instructions in your car. Baby seats are for babies weighing up to 13kgs (birth to 9-12 months) or until they can support their own head. They face backwards and are fitted into the front or rear of the car with a seat belt. They should never be used in the front where the front seat is protected with a frontal airbag. Child car seats are for children weighing between 9 and 18 kgs (aged nine months to about four years) and have their own straps. They face forwards and are usually fitted in the back seat of a car with a seat belt. Booster seats are for children weighing 15 to 25kgs and up to 135cm in height (aged about 4-11). They are designed to raise them so they can use an adult seat belt safely across both their chest and hips. Booster cushions are for children 22kg (3st 6lb). These are similar to booster seats, in that they raise the child up enough so that they can use an adult seatbelts safely. Also, try not to get distracted by your children in a car. Many on-road accidents involving women are caused because they were turning round to talk to children who were playing up. If things get out of control in the car, find somewhere safe to pull over and deal with it. Try and limit toys to non-missiles i.e. things that can't easily be thrown at you and ideally, put them in a bag and if they need distracting, put the radio on. What if my child is travelling in another car? Then take the seat you use out of your car and fit it into their car - properly. Don't be tempted to rush or not bother, even if it is a short journey. 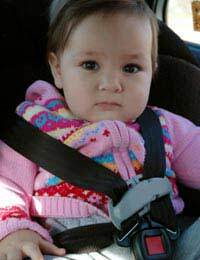 To learn more about the new laws - see our article New Car Seat Laws for 2006. Check the advice in your car handbook and the advice from the child seat manufacturer. If in doubt call the manufacturer's helpline or speak to your local Road Safety Officer. Is it legal for a 6 year old child to sit in front in a correct booster seat when travelling in France and Spain by car ?